"To carriers, masters of stage coaches, coachmen, watermen and bargemen, masters of vessels or passage boats, either coastways within Great Britain or to or from Ireland, or to and from parts beyond the seas, against unlawfully collecting, carrying or conveying letters, and to all persons whatsoever against sending letters otherwise than by the post..."
Above: Mail Coaches on the Road: the 'Quicksilver' Devonport-London Royal Mail about to Start with a new Team (The Devonshire to London Coach) by Charles Cooper Henderson (1803 - 1877). Date: between 1820 and 1830. Oil on canvas. 1635 The first public postal service began, with letters being carried by individuals on horseback between 'posts'. At each post the postmaster would take out the letters for that place, and a new post-boy would continue the journey with the remaining letters. The cost of sending letters varied according to the distance they were carried, and most letters, unless they came from major cities, were paid for on receipt. According to an article in Postal History International, letters stamped with ASHBVR/TON written on two lines and framed around existed as early as 1714, and continued until at least 1755. 1784 After lobbying by John Palmer, and with the support of William Pitt, the Post Office allowed a mail coach to make a journey from Bristol to London - it completed its task in less than half the time than the previous system. From this date mileage marks were used to determine the correct cost - this system continued until 1839, when weight, rather than mileage, was the determining factor. Mail coach routes quickly multiplied, with the London to Exeter route in place by the end of 1785. Routes then became established between main towns as well as to and from London. Each mail coach carried an armed guard, who sounded a horn to warn people that the coach was coming. They also carried passengers both inside and outside the coach, but no-one was allowed to sit with the guard at the back. The coach also only stopped for postal business, not for the convenience of the passengers. If the coach did not have to stop at a particular town, the guard would throw out the bags of letters to the Postmaster (also called the Letter Receiver), who would in turn throw bags of outgoing letters up to the guard. Contracts were awarded for operating these coach routes, with the contractors organizing fresh horses along the route, about every 10 miles. The British Postal Museum and Archive hold many records for the appointment of employees of the Post Office from early Victorian times until to 1956. Amongst them, in POST 58/39, are the records for deputy postmasters. These records show that in 1820 William Lloyd was appointed on the resignation of Mr. Eales. He resigned in December 1833, when Samuel Porgate Knowles took up the post. William Barons, innkeeper, was appointed at the beginning of 1842, when Knowles resigned. When a bake-house and malt-house in West Street were advertised to let in 1834, Ashburton was described as a Borough, Market and Post Town. 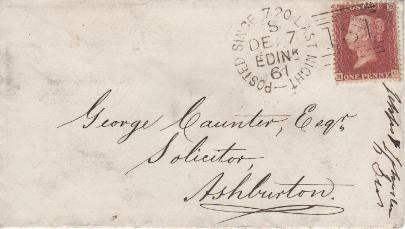 Applications had to be made to Mr Cooke of Exeter, or Mr Morcombe, mason, of Ashburton - any letters had to be post-paid. In 1838 Marian* Adams, aged 74, died. She had been the letter carrier to the town for 44 years, earning the 'paltry sum' of two shillings a week for delivering letters and newspapers twice a day. Her donkey, Betsy, bridle, side saddle and plated spur were all sold at auction, and were bought by the Sexton, Wm Hamlyn, for 3s 6d. *almost certainly should be Barons. However the letter below, sent from H Callard to R Tucker Esq, appears to be still using the old system. 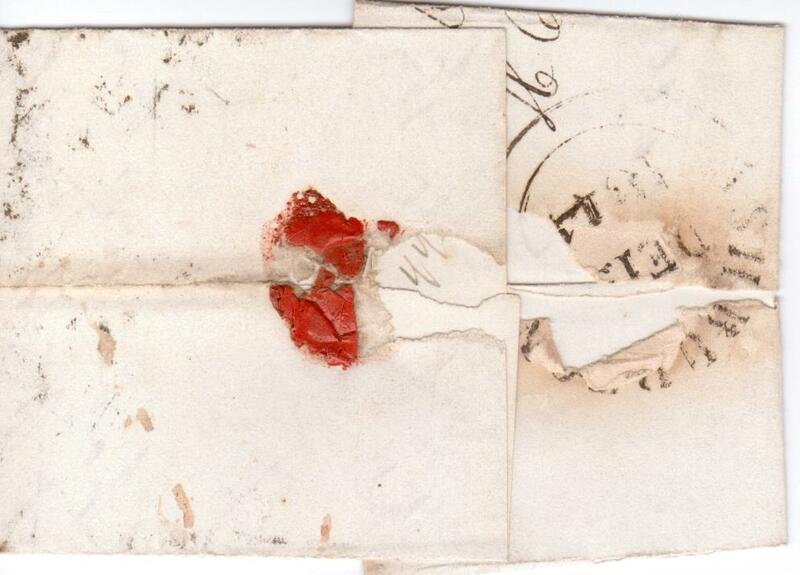 The letter (not in an envelope), is folded to 8.5cm x 5.5cm - approximately 3" x 2", and was sealed on the back with wax. In 1841 Samuel Lloyd, a clerk in the Ashburton Post Office, was on a charge of felony. He absconded and arrived in London, intending to board a ship, George, headed for the Cape of Good Hope. However he missed the ship, and fifty pounds reward was now offered if Samuel was apprehended and convicted. Samuel was about 17 years old, about 5 foot six inches in height with light hair and pale complexion. He was slender, with a thin face, and was wearing a pilot coat and brown mackintosh; he had last been seen at Deptford, attempting to purchase a hat. 1844 The Post Office* was in East Street, with William Barrons as postmaster. Letters from places such as London and Exeter arrived each morning at 8.45, and were despatched each afternoon at 5.20. Letters from Kingsbridge and Totnes arrived at 9, and were despatched at 5. * The same directory lists the Golden Lion Family Hotel, with landlord George Bate, as a posting house (and excise office). 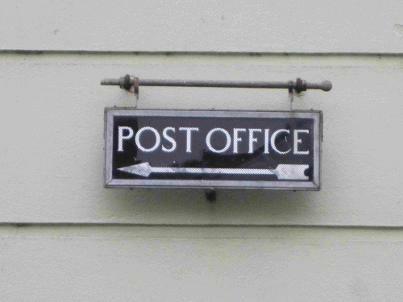 A post or posting house could either be a post office, or an inn or other property where travellers could hire horses. It is possible that the Post Office was located in the Golden Lion, or it may have been elsewhere in East Street. In 1891 Messrs Whiteway and Foot, selling the London Inn, described it as a Family and Commercial Hotel and Posting House. This is obviously being used in the sense of a place to hire horses, as the Post Office was by then in St Lawrence Lane. 1846 The stamp office moved to Mr Burrow's, at the Post Office. A large box and bag of mail arrived at the Post Office from Kingsbridge, sent from the ship Ellenborough. The ship had been at the Cape of Good Hope: Capt Close was the captain. Inhabitants of places such as Broadhempston and Staverton not only had to pay the postage rate, but also had to pay 4d or 6d for people to bring their letters from the Post Office. A petition resulted in a daily post: when the London letters and newspapers arrived in Ashburton, a carrier then took the relevant items to the outlying parishes. In 1847 the Western Times reported that the Quicksilver Mail was about to leave the road, replaced by steam. It still appears to have been operating in October, but perhaps on limited routes - The Exeter Flying Post detailed the journey of a letter from Plymouth to Brent. The Quicksilver mail carried the letter through Brent on its way to Totnes, and it then went to Newton by rail. It arrived in Ashburton the next day, and from here a messenger carried it by foot the eight miles to Brent. 'This is your Railway Improvements'. 1848 The Western Times thought that the Postmaster General should be petitioned to have the Plymouth post delivered to the South Brent railway station. Plymouth letters at the time could take twenty hours to get to Buckfastleigh and Ashburton, which the paper obviously considered too long. 1849 The Post Office closed on Sundays from 10am until 5pm. To save 'trouble and inconvenience', a postage stamp had to be put on letters. In 1851 the Exeter Flying Post reported that the Post Office had moved to the head of East Street*. The paper said that whilst this was 'very convenient for the few' who lived near it, it was a long way for everybody else. 1852-53 The Post Office was in East Street, with William Barons as postmaster. Letters from all places such arrived each morning at 7, and were despatched each afternoon at ten to six. The same article said that some people could remember the mail coming from Exeter in a small cart drawn by one horse. 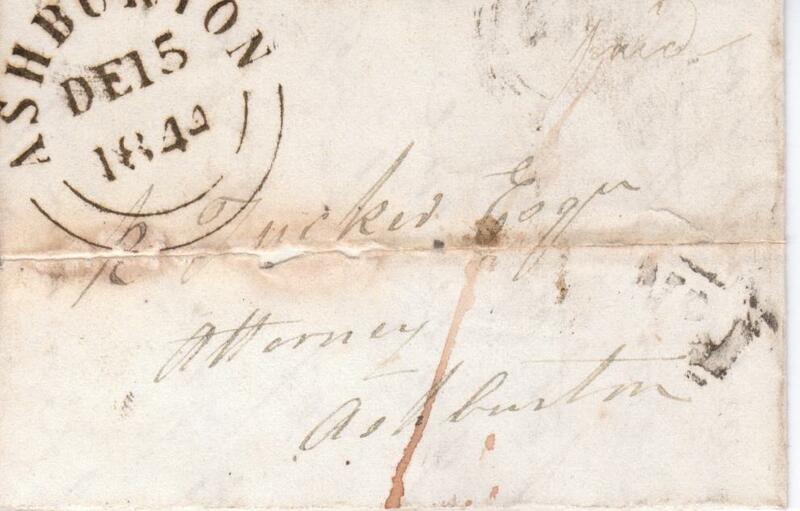 Mail sent from Ashburton to Plymouth went by a messenger on a horse carrying saddlebags. The Bullring post box, which could take letters and papers arrived a year later. In 1859 Mr Govier, with the letter sack on his back, fell down between the wheel and the shaft of the mail cart when the horse started. He dislocated his shoulder. 1861 William Barons, aged 73, is still post master on the 1861 census. 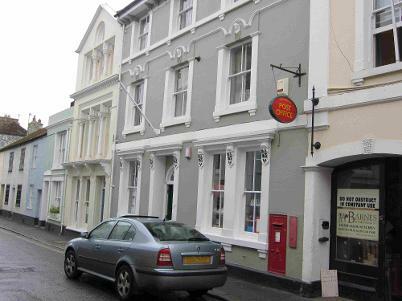 The Post Office is roughly six properties up from the Golden Lion on the same side of the street (ie the south side). William Barons died 22nd June 1863, and was described by the Western Times as having been post master for nearly thirty years. His daughter was appointed postmistress in his place. 'Post and M O and T O, S B and annuity and insurance office. (Railway sub-office. Letters should have R S O Devon added). William Henry Edgecombe, postmaster, East Street. Letters are delivered 7 and 11 am and 4.30 pm, dispatched at 4.32 and 7.15 pm. Box closes at 7 pm weekdays and 2.30 pm on Sundays. Money orders are granted and paid from 8 am to 6.30 pm. Wall box, North Street, cleared at 6 pm, West end 6.5 week days only. Above: The Golden Lion Hotel, East Street. The edge of the portico supporting the lion says, (I think) Family Hotel and Posting House. William H Edgecombe is still the postmaster in the 1891 census. Edwin W Johns is a (the only?) Town letter carrier and grocer in the same census. In the 1901 census John F. Eales, aged 51 and living in St. Lawrence Lane, is a rural postman. Married, with two daughters, he was born in Guernsey. 1908 saw a devastating fire in St Lawrence Lane in which John R Eddy, aged 80*, died. In 1916 a postman, Mr F H White, retired. He was presented with an ebony walking stick with a silver mount. He had worked for nearly 32 years covering the Ashburton, Widecombe and Buckland route. A motor hearse broke down at the top of Austwell [sic] Hill in September 1923: it was on its way to a funeral in Widecombe. The coffin was transferred to a royal mail van. Above: Sign at the corner of St Lawrence Lane and East Street. Mr H Hannaford retired from being a postman in 1928. He had begun as an auxiliary postman in 1892, and had worked on the Holne and Poundsgate, and later the Woodland and Landscove rounds. He was presented with a mahogany clock and sugar basin. In 1936 William Wilkinson, otherwise known as Blackjack or Snowball, was found dead at his lodgings in Kingsbridge Lane. Regarded as Ashburton's most eccentric character, he spent most of the year wandering over Dartmoor, or sleeping in a hut near Bickington. Although far from destitute, when he was found his many layers of coats and jackets were mostly held together by safety pins. He had appeared before the justices at least twice charged with attempting to defraud the Post Office by sticking used stamps to parcels. His defence on one occasion was that he had £800 invested in the Post Office, so would be unlikely to want to defraud it. Mrs Leonard Waldron*, an Ashburton postwoman, was involved in an accident in July 1949. Her cycle collided with a car at Caton Cross, and the St John Ambulance Brigade took her to Newton Abbot Hospital. 1871. Telegraph wires were being erected between Totnes and Ashburton. 'It appears now that we shall soon have this convenient communication so long expected by the manufacturers and tradesmen of this place...' The Western Times concluded that the railway works had caused the delay. Some telegrams sent and received. On Easter Monday 1879 the Volunteers were about to leave by train to take part in manoeuvres. Lieut Col Templar sent a telegram to cancel the manoeuvres because of rain and snow. A series of telegrams in 1880 told of the stranding and possible wreck of the steamer Sorata at Cape Jarvis, en route to Melbourne. Later telegrams said that the passengers were safe, and that the ship might be saved. 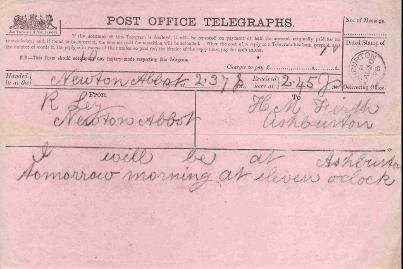 Above: A telegram to H M Firth in 1876.